Its with great pleasure to have the Criterion Hotel as our new major club sponsor for 2018. We look forward to the exciting year ahead with Damian, Sheree and staff. Singleton Roosters AFC are grateful to have Hunter Valley Glass as sponsors. This season will be the 30th year Hunter Valley Glass has supported the Roosters. Hunter Valley Glass has helped the club in many different forms, from assisting in yearly league entry fees, club expense and making our trophy cabinets. Players past and present appreciate the opportunity you have given them to play the greatest game of all. Hunter Valley Glass provide a comprehensive glass and windscreens service offering products that include household and commercial glass, windscreen replacement and repair, mining and earthmoving glass, mirrors, showerscreens, window tinting, mirror wardrobes. Our Aluminium Team also provides safety doors, flyscreens, safety grilles, flyscreens and aluminium shopfronts. Singleton Roosters AFC welcome back our long serving sponsor SportsPower Singleton. Ben Hedley is a retired Rooster but still shows his love to the club. Hedley, Corrine and the team have a huge range of sporting equipment, apparel, shoes and the perfect pair of footy boots to kick your 100 goals. Stop in at 89 John Street, Singleton and follow on Facebook for the latest deals. ACS are a long-serving sponsor for the Roosters. They provide a comprehensive range of services to the mining industry including labour support, component overhauls, training, data analysis, parts supply, fault finding and rebuilds. ACS provides solutions to the mining industry with an emphasis on safety, innovation, customer service, and ethical management which has enabled them to develop a solid reputation as a quality services provider. Ph: 0265 749 700 or go to www.austindo.net.au for all your consulting needs. Singleton Roosters AFC would like to thank Andrew MacPherson of Andrew Macpherson Carpentry for his continued sponsorship. 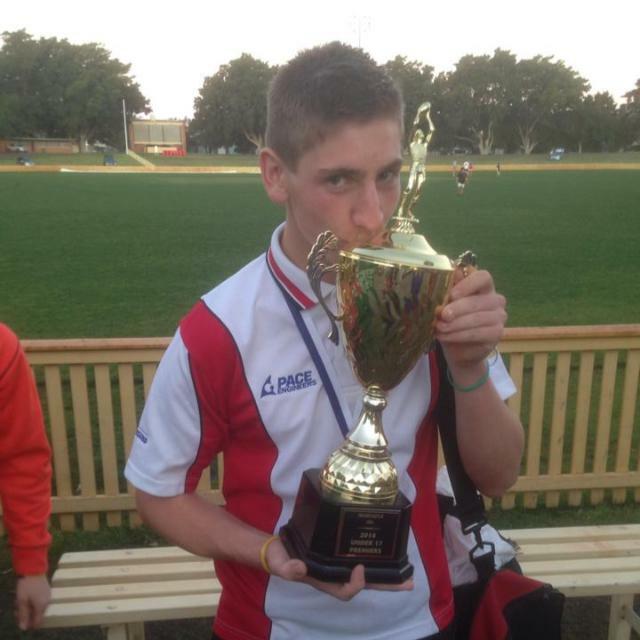 Andrew, aka “Macca” is a Roosters stalwart, he begun as a Rooster junior and played through the grades to seniors. Most recently Macca co captained our premiership team and this year he continues his support and commitment by sponsoring, playing and coachingÂ the Women’s division. Andrew MacPherson isÂ a qualified carpenter. Specialising in renovations, building outdoor decks, awnings, patios or any other carpentry needs. 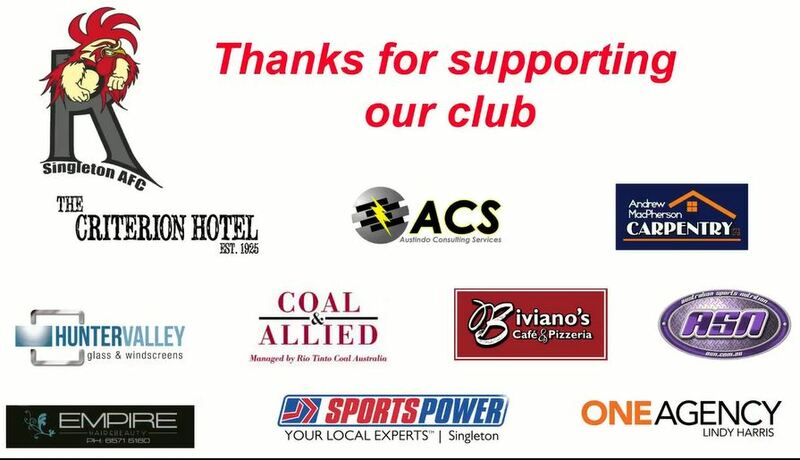 Singleton Roosters AFC would like to thank Coal and Allied for their donation this season. The Roosters were successful in winning a grant by Coal and Allied to supply trainers medical equipment for the season. Singleton Roosters welcome back ASN Singleton as a sponsor for our 2017 season. Head in store and see Rohan and the team for the right advice on your supplement, dieting, training and recovery needs. 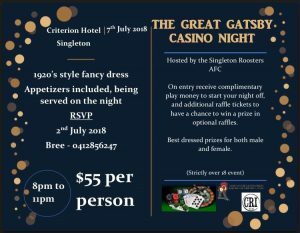 Be sure to mention you’re a Singleton Rooster and a % what you spend will be donated to our club. ASN is located at Shop 4, Gowrie Street, Singleton. In the complex near Gowrie Street mall. For more great deals follow ASN Singleton of Facebook. Singleton Roosters AFC welcome back Biviano’s Café and Pizzeria as sponsors for 2017. Biviano’s is an ideal place to take your special someone for Valentines day. Whether for lunch or dinner, you can enjoy their amazing pizzas and Italian cuisine. Call now to make your booking or stop in at 130 John Street, Singleton. Singleton Roosters AFC would like to thank Lindy Harris, One Agency, for continuing their sponsorship for 2017. Lindy Harris is a highly respected and experienced real estate professional, having established herself as Singleton’s premier agent over the past 15 years. Lindy has an uncanny flair for matching people with property, so be sure to see her to rent, buy or sell your property. 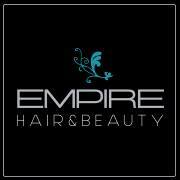 Singleton Roosters AFC welcome Empire Hair and Beauty as 2017 sponsors. If you are looking to sort out your head piece or need beauty work done, head on down and see Brittany and the team. Please show your support to this top local business and mention your a Singleton Roosters and a percentage of money is donated to the club. Shop 3/1B Pitt St, Singleton, Phone # 02 65715160 and follow on Facebook.